I've been working on making friends here in S.MD and I met a couple at church (I will have to figure out a Teh nickname for them as we get to know each other better!). She writes a blog that I'm reading and one of things that I really wanted to copy (isn't that what we do in the blogging world?) 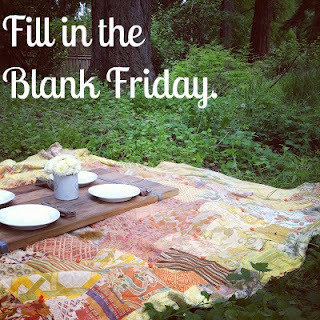 was fill in the blank Fridays! Hopefully, I can manage to stay on this boat, as it is just a weekly post, but we all know how I end up being about things like blogging schedules..... oops. So for my first fill in the blank Friday, here we goooo! 1. The best surprise ever would be: Teh Bear telling me he found a job and that he needs me to fly down to FL to help him move up to MD... or Teh Bear being moved into my apartment when I came back from Australia. Either of those are valid options. 2. Laughing with anyone are my favorite memories (ok, I took some liberty on that one). 3. The hardest, but most worthwhile thing I've ever done was: gone to college, joined the navy, never, ever, ever getting back into a relationship with someone after we'd broken up. 4. The best part of my day is: Getting to talk with Teh Bear since he usually makes me laugh/smile. 5. Something I like that most people don't is: Livermush. 6. Something I am willing to fight for is: fairness. 7. Something you might not know about me is: Rarely do I believe that I'm a nice person and I often worry that I'm being "mean" or "bitchy". YAY for first times!! I love doing new things on Teh Blog!! I often worry that I'm being mean too, and so I feel like I'm overly nice to compensate, and THEN I feel like it makes me seem fake. It's a terrible cycle.